Lawrence of Arabia. Horizon Pictures 1962. Well, I’ve spent plenty of time getting to know how magnetic Peter O’Toole is on screen, it’s high time I got to his most legendary role. It occurs to me that everything I’ve seen him in has cast him as a sort of amiable streetwise rogue and/or tortured sage, while I have the impression of Lawrence as more of a stoic military figure, probably with an inner struggle he doesn’t let his men see, which is one thing O’Toole does well. Then again, what do I really know of the story? I recall it may concern training native soldiers, and there’s a famous desert-crossing montage. Yet another film that’s known more by its reputation than its actions. Hardy, stubborn, and infuriatingly well-educated, British Lieutenant T.E. Lawrence is turned over to the army’s Arabian division for six weeks in order to “appreciate the situation” on the WWI front against the Turks. While en route through the desert, he impresses and befriends his Bedou guide, until the man is killed by Sherif Ali for drinking from a well forbidden to those of his tribe, and Lawrence must make his way on his own. Reaching Prince Feisal, Lawrence observes the fundamental disconnect between Arab and British interests, and ponders how to serve both. His solution: take a stronghold port by crossing an uncrossable desert. Without British aid or permission. 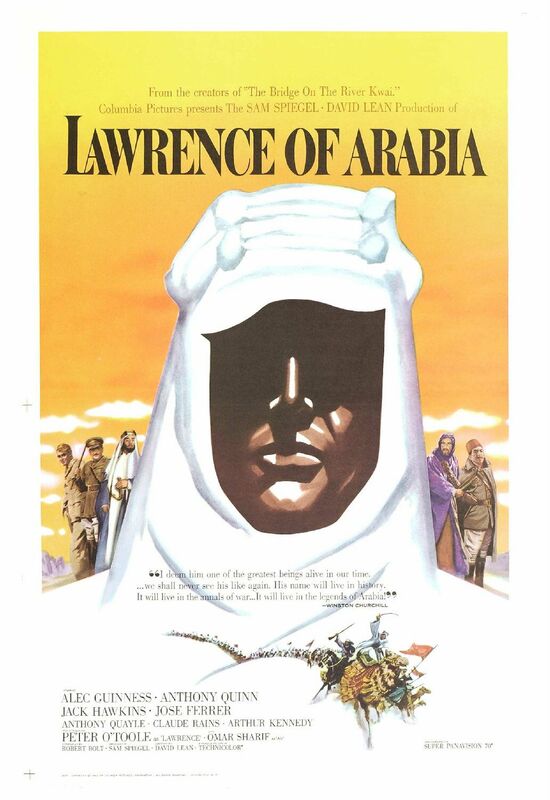 With fifty of Feisal’s men martialed by Sherif Ali, Lawrence inspires the tenacity to reach the other side and earns legendary status among the Arabs as El Aurens. While his utility to Britain and the Arabs is quite clear, no one quite knows whose side he’s really on, perhaps least of all Lawrence. It’s not so much that this film includes a montage of crossing the desert as that it is a montage of crossing the desert. At least an hour of its almost four hour runtime is gorgeous desert with camels walking by as if to justify the lingering cinematography. The barren wasteland never looked so lush. The Ten Commandments and Ben-Hur provide lavish production value, but this may be the pinnacle of money on screen. Not only are there hundreds of extras on camels in vast locations, but the camera captures then perfectly, they fit into the luxuriant pace lovingly, and the score complements it all exquisitely. This is a great work of art, and that largely but not entirely made the great investment of time with a low ratio of story hold my attention anyway. There is a strong interpretation of Lawrence here, but it feels like O’Toole is only living up to the writing and directing. While the characters describe him as a flamboyant narcissist, he reads to me not so much as feeding on praise as feeding on his own sense of self-importance and using his fame as the means to continue showing himself how great he is. It’s a belief he’s held from the beginning, and leading a revolt on behalf of the Arabs is only the most spectacular way to demonstrate it. In true mythical fashion, a meteoric rise comes with an epic tragedy of a fall. The first half of the film is the making of Lawrence, and the second half is the slow dread-filled unmaking of him. A man who even when forced to face the fact that he is not invincible and must grab what he can through more cynical means, only digs in further on his idealistic goals, until there is nothing left for him. The self-destruction of a tragic hero. Is it true? It’s true to the spirit of one interpretation of the man. It tells an epic story, and mythologizes a modern legend. Like The Iliad, it’s not history, it’s better.